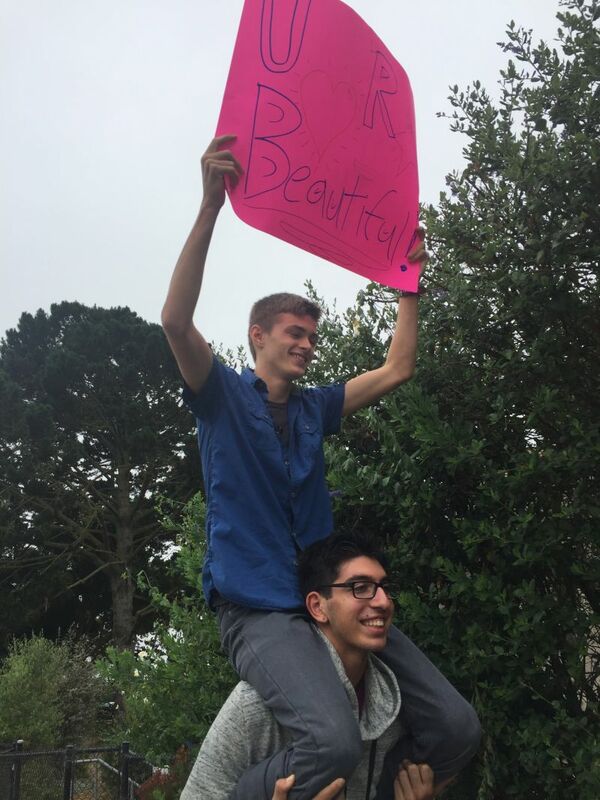 On August 24, the Kindness Team circled up with a new class of high school seniors to practice radical kindness. 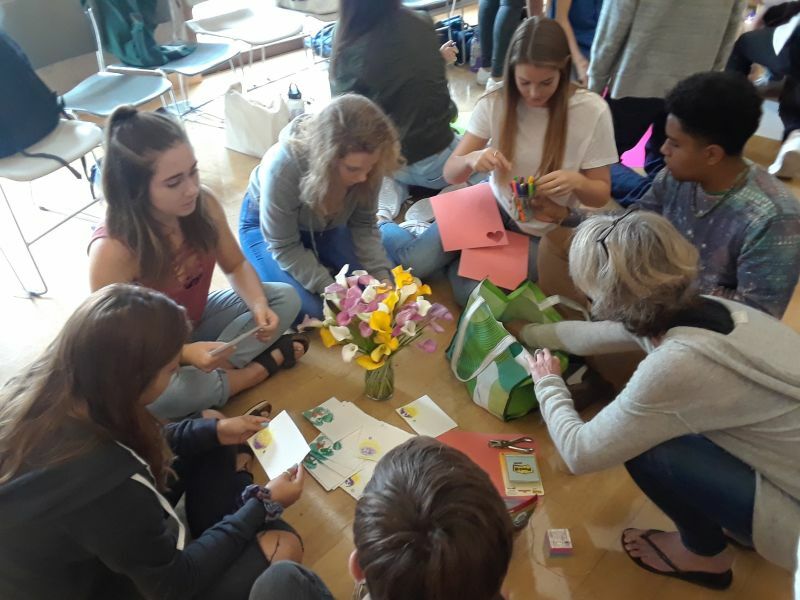 At the beginning of each year, and again at the end, Joan Caldarera - a humanities teacher at SF Waldorf HS, invites our ever growing and changing Kindness Team to come and share silence, presence, stories, and engage in random acts of kindness. It is so simple and equally profound. 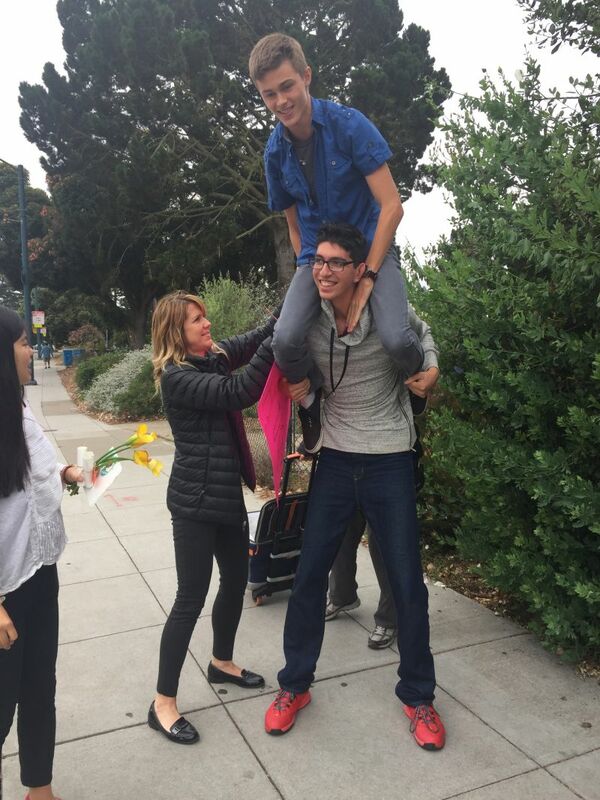 This year, Elijah - a former SF Waldorf student himself returned in the spirit of generosity and reciprocity. Sitting in the circle, eye to eye with each student, he shared the different perspectives - as a student and now an alumni - openly sharing the challenging and negative attitudes he once held and how they not only changed but helped determine the direction of his life passion. With an open heart, Elijah shared, "You can fight your teachers or you can learn from them." Elijah set the tone for a day of deep honesty and freedom. At the beginning of the circle, as we joined the students and teachers to sing "Blowing In The Wind," a sense of unity manifested through the magic of music. To me, it was a moment of connecting our hearts and minds, spontaneously and openly. Each time when Pancho says to the circles of friends that if this is the last time we see each other, he wants to let us know that he loves us, tears flow up to my eyes, and it again deeply moved me and many others. How powerful and incredible it is to immerse the young students into true love, and to plant the seed of love into each of us. I hope that one day, if we happen to wander in life’s journey, we will see that in fact, we are not lost because we find the seeds that were planted inside us; and we can go on through nurturing these good inner seeds. When we were asked to share an act of kindness that we received in our lives with our neighbors, I had a moment of sharing with Max, who sat next to me. Max, a young man who seemed timid at the first place shared with me a beautiful story about his mother. She sends Max to school every morning no matter how much she has on her plate because she wants to spend more time with Max. It was a simple yet profound sharing. Beautiful to connect with Max, and beautiful to learn about his gratitude and love toward his mother--a woman whom I don’t know yet embodies the compassion of mothers. As a child and sister myself, I felt her love. Andy’s activity invited us to walk in the space and look into the eyes of someone who happen to be next to us. This felt unusual for many of us, however, it was powerful to learn to look into others’ eyes, hearts and stories. Through our eyes--the gates to our hearts, we sent love and good wishes. In the end, I was moved by the rapid transformations all of us went through within such a short amount of time. I saw students approaching the Kindness Team to share reflections and ask deep questions; I saw smiles and friendships bloom; and I saw we came alive. Three years ago, I was at their position as a senior at high school. We might be stressed out by the intense college application process and wonder the meaning of life; we might care about how attractive we seem; or we might be struggling between the dark and light. However, it is special to remember that there was one day, kindness washed over us when we honored mother earth, gave free hugs, swiped the streets with love, offered flowers and cards to an old lady walking on the street, left positive messages on someone's car, and much more. I was struck once again by what can happen when a sacred space is created. 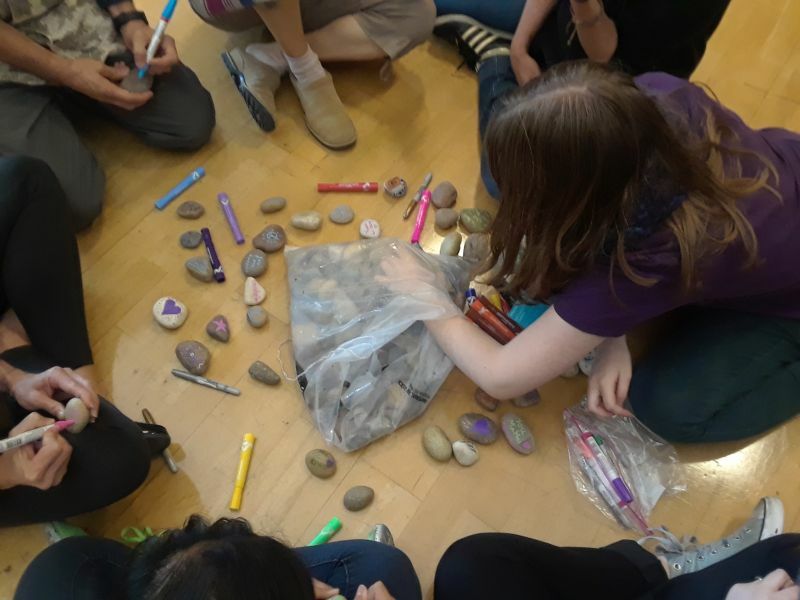 After the heart touching Morning Verse and two Bob Dylan songs of peace, the kindness team members each brought gifts of activities or stories that elevated the vibration of the room allowing everyone to drop in deeper as our day began to unfold. 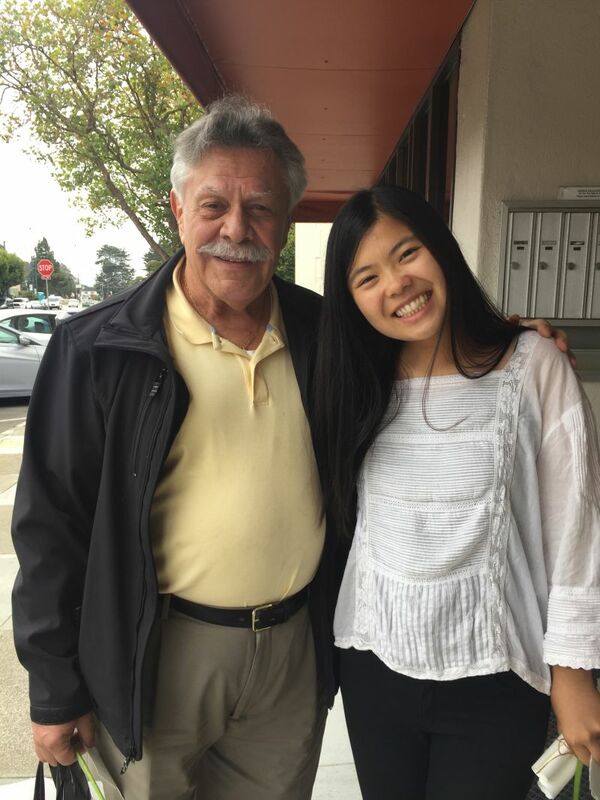 Stories of kindness were shared by Kindness team members including one by Sophie, who shared the kindness she experienced by a teacher upon her arrival to the US many years ago from China, who invited her to dinner on a weekly ongoing basis. This connection gave her a sense of belonging and helped to create a family for her after arriving to this foreign land. 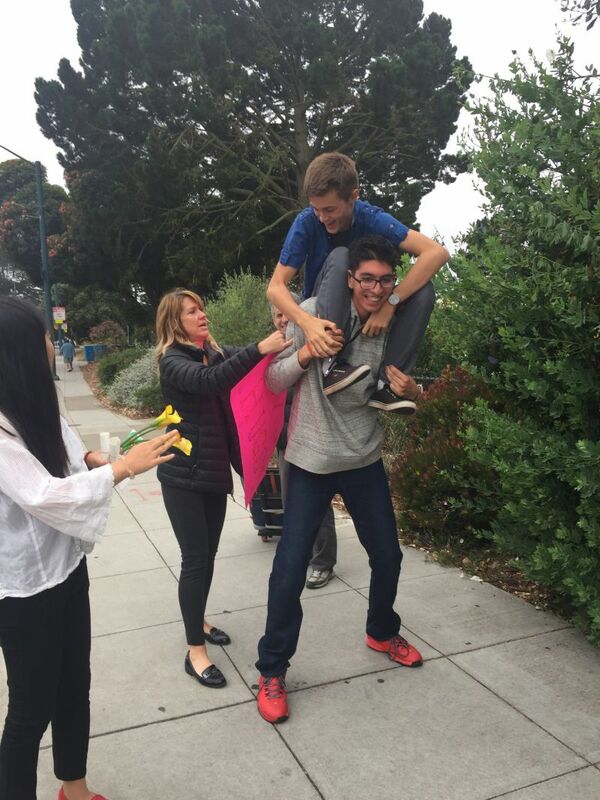 Many students pushed their personal comfort-zone limits during an exercise that invited them to make eye contact with fellow students, teachers or Kindness Team members while sharing intentions of joy, love, compassion and peace with one another. One student reported that the eye contact portion of the exercise, while being uncomfortable, became easier after some time. Another student said that connecting this way with a close friend would have been much easier. It was a joy to experience students pushing their limits on interpersonal connection in this way. In a world of increased social media, smartphones and decreased intimate connection, seeing students engaged in this exercise deeply nourished my heart. I was struck by the ability for the students to spontaneously contribute to the 7 directions ceremony with wise and beautiful words for their respective direction. The young woman with Jamaican heritage, who was invited to share something regarding the sun being high in the sky, talked about the sun at high noon bringing light to all things. For me, her words invoked a strong sense of that depth of seeing we experience when our awareness is broad, filled with love and shining bright. This was followed by planting a beautiful Japanese maple tree which in the fall will become a burning sunset of reds, oranges, purples and yellows… sure to continue to inspire by its very existence. After our kindness activities in the street one of the young men of color approached his teachers, myself and Pancho and told us he would be extending some of the kindness activities (free hugs, flowers gifting) we had just completed in the streets adjacent to the school at the upcoming Peace, Love and Understanding rally in San Francisco. I was part of the rock gifting team. Team members, using paint pens and sharpies, wrote beautiful message of love, peace and in some cases beautiful art on rocks. We distributed them, leaving them in trees, on sidewalks, in doorways, on restaurant window ledges. After walking several dozen feet after leaving a rock at one restaurant we heard an energetic “Thank you” coming from behind us. When we looked back the person and the rock were both gone. This activity unlike the “free hugs” activity is one that we do in the spirit of not knowing. It could be hours, days or weeks before these anonymous gifts reach the heart of someone who finds them. The rocks were charged with love and sweet intention and left for some future magic moment of someone whose face will likely never lay eyes upon. When I first walked into the room full of energetic seniors, I admit I felt nervous! Would I be able to connect with this age? Would they think I was a dork?! But all it took was Elijah's beautiful share for me to relax and remember: I'm with Service Space people!! How could anything be anything but perfect?! 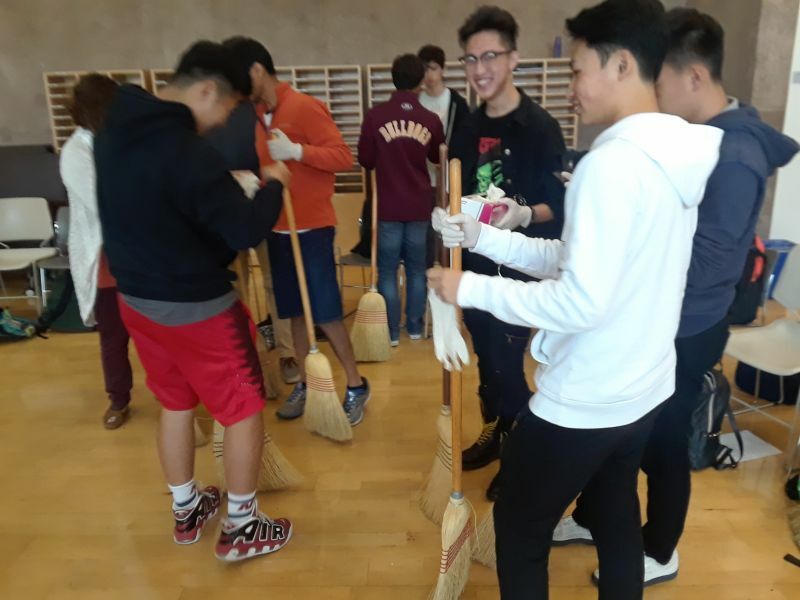 The uplifting energy of the students during and after the kindness acts on the streets was very contagious, as one student described his feeling as "ecstatic," and realized that he hadn't stopped smiling ever since he went on the street. The signs of "Free Hugs," and "Honk If You Are Happy" rippled out much positive energy to many local residents and those who happened to pass through. As a student shared that a young daughter on the passenger seat saw the sign and reached to honk while her father was driving. Some students even got on the Muni to offer hugs. It seemed their sometimes "mischievous" and playful energy was put into kind use. 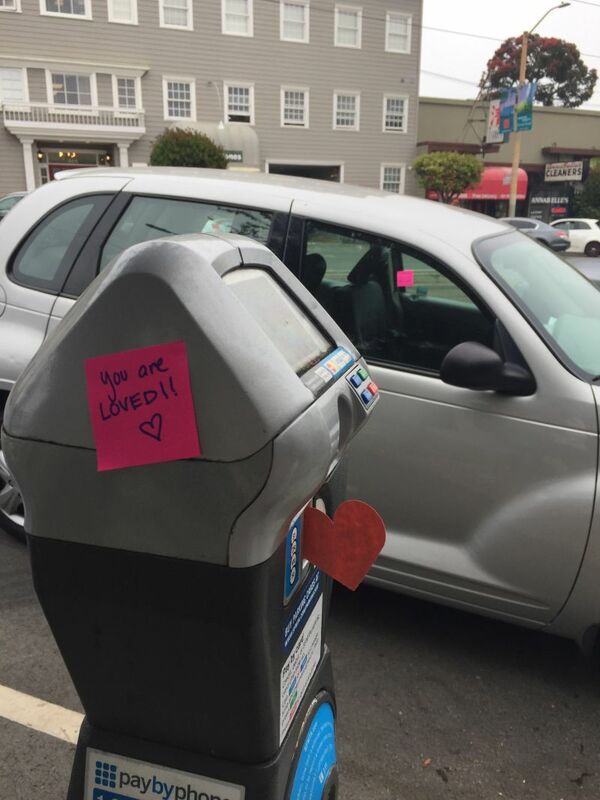 :) Some strangers on the street expressed how much they needed such kindness during this time. "Wow! A hug for me?" "You made my day!" "Thank you!" 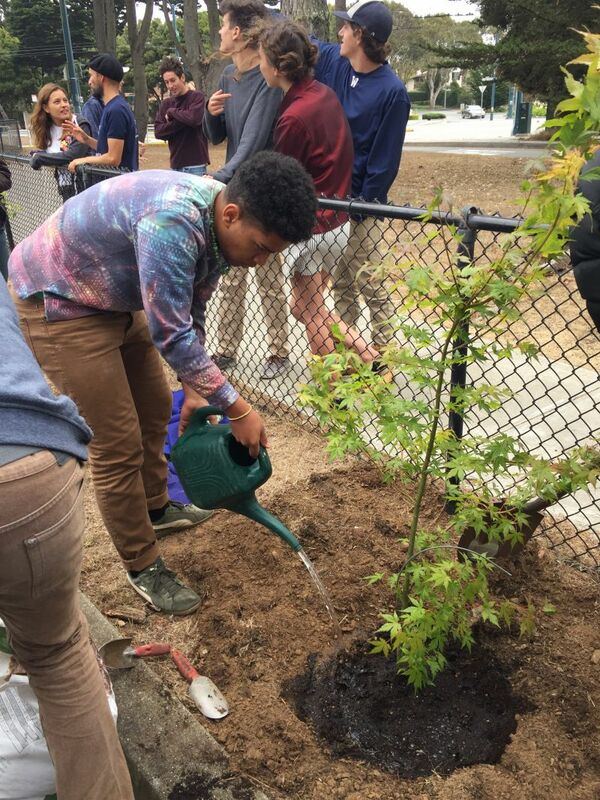 Anne's seamless laddership, Pancho's presence and words, Elijah's return as a Waldorf alumni, and all other Kindness Team members' contribution were all beautifully and organically woven into the flow of the day. During our post-Circle checking-in, Anne even felt "selfish" for doing such a Kindness Circle because of the amount of goodness that she received. :) This morning, still feeling a little "hangover" from yesterday's Kindness Circle, I feel grateful and honored for being part of the Kindness Team. Wow! Kindness is a gift that keeps on giving...Life CAN be that sweet! I am still high on love and got to share it in the evening with my beautiful drumming community and with my soul sister Poonam as we do our Soulforce work. We got inspired and decided to express our gratitude to the people around us: the gentleness of Special Ed Teachers who come with their students to the cafe where we work and the security guard in the parking lot who consistently lets us park there longer than we should knowing that we are not even going to the assigned businesses and, kindly lets us know where we should park not to get in trouble. We approached him to say thank you and get to know him. His name is Braiman and he is from Ghana. He has been here 5 years by himself and misses the sense of community he has at home compared to how interactions go down here in the Silicon Valley. He works 2 jobs and has not been able to have a community here. We were energized by his natural sense of joy AND also touched by the sadness in his eyes when he talked about his home and family and told us that he has no one to talk to when he is not working. I invited him to join the drum community in San Jose and Poonam bought him lunch. I am looking forward to our future interactions... what a beautiful dude! Now reading Xioa's reflection is also reactivating those positive feelings and intentions. THANK YOU!! 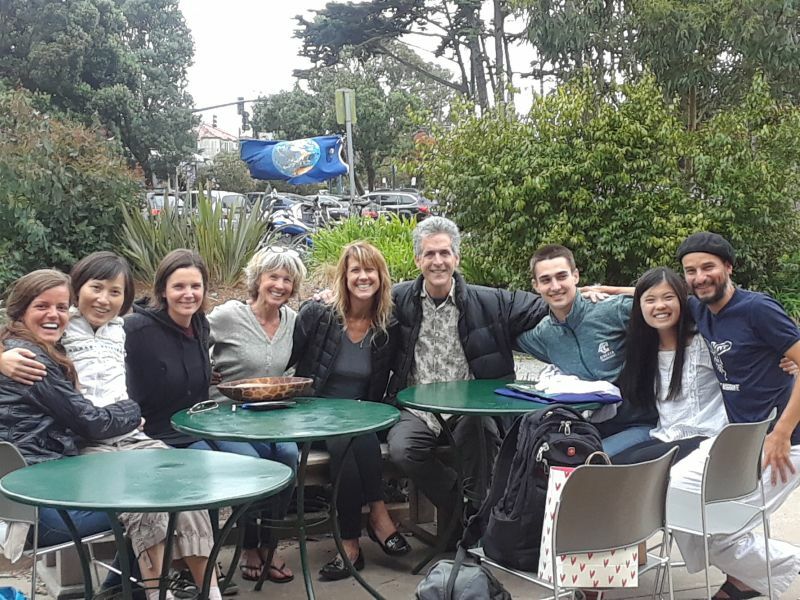 Joan connected Soulforce to the Waldorf school of the Peninsula in Los Altos and browsing their website inspires me and gives me hope that kindness can be an organizational principle. I feel gratitude for getting to be part of the Kindness Team and inspiration from each one of you and the way you are in the world. I am looking forward to many more beautiful interactions. The day after the Kindness Circle at the SF Waldorf High School I opened the Awakin Circle we host at Manantial de Luz every Friday. The passage was a beautiful text from Masanobu Fukuoka, a farmer and philosopher celebrated for his natural farming, called “There is no East or West”. The passage, amongst other things, reflected on what purpose means, and how originally human beings had no purpose, but now we struggle away trying to find the meaning of life. The text brought me back to the Kindness Circle: all the volunteers went to the High School with a short agenda with some activities to do, but the beauty of a “Kindness Circle” is that there is no purpose. We just showed up there with our hearts open, open to listen, open to embrace whatever is alive in the circle. Aware and present. The wisdom is already in the field, in the space, and it’s just a matter of time that such wisdom is revealed. Volunteers share stories, movement exercises, and invite the students to do some random acts of kindness or create their own way of participating. Students can always choose whether to remain sat or participate, but the energy of the circle shifts from moment to moment and then, the truth reveals itself: they all get engaged in participating and creating their own labels (free hugs, hug for a smile, I love your hugs, honk if you are happy, etc.). 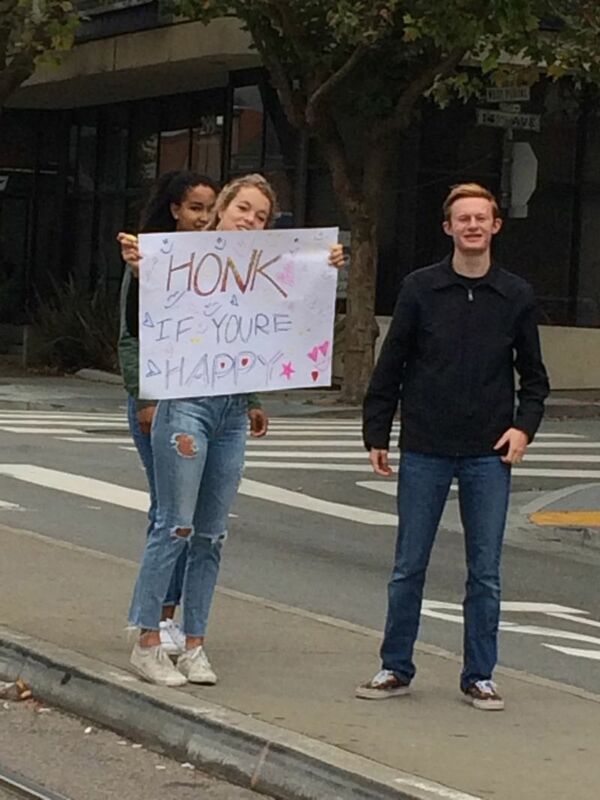 They swept the streets, gifted tulips and grapes to the people passing by, gave hugs to people on the bus, stood up in the middle of the intersection with great smiles to wish everyone a happy day and cars started to honk their horns. By then, the energy of the group is flowing like the waterfalls into the ocean. The truth is the love, the kindness, the connection, the compassion, the gentleness that is flowing through each one of us. After the last reflection of the day, we stood up in a circle outside calling on the Medicine Wheel, speaking for the North, the East, the West, the South, for Mother Earth, for the Sky, and for the so called Nahí by the Native Americans, the flame that we all have lighting within us. Then, the students that feel called, speak for the four directions. Right there, without any time to prep or write about it, some students volunteered to speak and it flew in a magic way, their wisdom arose. A student next to me shared: “in the west, where the sun sets, it’s time for reflection, time to think about how your day went, and reflect what you can learn from it”. Not a single purpose would have made us peal the layers of the field like that. May we all be kind, compassionate and wise. 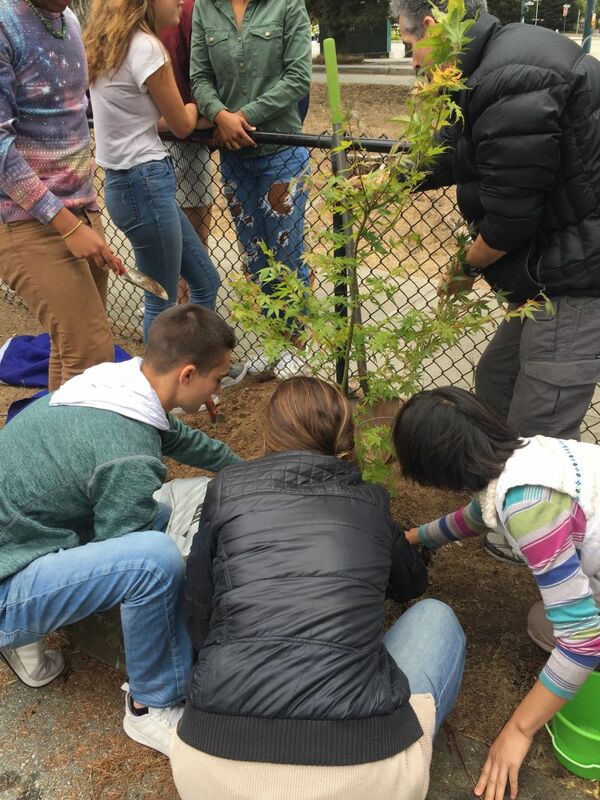 Deeply grateful for all the kindness team and for the senior class at the Waldorf High School. Kindness previously has brought me joy and satisfaction...today it brought me Confidence and Purpose. Both disease and LOVE are contagious. Let's continue to win the battle! Thank you all for an AWESOME day! I can't thank you enough for the beautiful day you gifted us with last week. The students, too, wrote in reflection on the week we had spent together focusing on the three soul attributes: their feeling, thinking, and willing. The comments, as you might expect from them, were not uniformly in praise of everything I had tried to pull together for them, but all found light within the Circle on Thursday, many citing it as their favorite day. When the people from Service Space started sharing their stories, there was an immediate shift in the presence of the room. To me it felt like a much more free and open group of people. I think everyone sort of got a wake-up call as to how much their actions affect the world. I thought it was a lot of fun and I felt like it gave me a different way of looking at the world. It was such a positive experience that the things we did earlier in the week began to make sense and I found meaning in them. With Pancho and the lovely Kindness Team we were shown a beautiful way to go through life. We practiced being loving, compassionate, kind, and positive. That brought an awareness of other people's feelings and of our impact on the world. I also learned that if we as a society have a mindset of love and kindness, we would be much happier. Being generous will get me further than being greedy. It was immensely touching to watch the direct effect of my actions. This activity inspired me to be more mindful of the manner in which I give and receive such kindness in the future. I noticed that the idea of random acts of kindness was almost incomprehensible for many of the people I encountered. A few even asked me what we were getting from this in the form of payment, service hours, or completing an assignment, as if spending time in service of others would only make sense if it were required. I especially enjoyed the moments of prolonged eye contact. Working with Pancho and his crew made me extremely happy...put me in such a great mood! Life doesn't have to be so serious. It's nice to have some fun here and there. If we all share a little bit of our kindness to the society, the world will become a better place. It made me realize that I need to stop more in my life to just to sit an "wash my mind," and think more about others rather than be completely caught up in myself and my problems. ... It made me feel so good and happy that it made me want to bring happiness and love to more people every single day. This exercise made me recognize what is really important in life and opened my mind to the rest of the world. So much appreciation! I can't wait to see you again in May--and many thanks and smiles and hugs. This is amazing... I feel very lucky to participate in tomorrow's kindness circle at Waldorf HS.